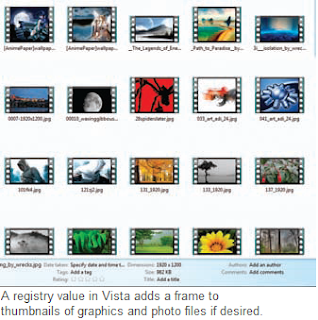 You wish to give your Windows system an individual touch and hence are wondering if you could give your small preview pictures, your graphics and digital photos, the ‘Thumbnails’, an unusual frame. Of course you can! You can actually you’re your thumbnails an unusual frame. For that, start the registry editor, by typing ‘regedit’ in the search fi eld of the Start Menu and pressing [Enter]. In the tree structure, navigate to the key ‘HKEY_CLASSES_ ROOT\SystemFileAssociations\image’. On the right side, there is a value called ‘Treatment’. If that is not there, create it with ‘Edit | New | DWORD-value (32-Bit)’. Then open the entry by double-clicking. In the following dialog, ‘Edit DWORD value (32-Bit)’, enter one of the following values, with which, you can determine the diff erent types of frames for the thumbnails. The option ‘3’ gives your thumbnails a frame with holes like that of a fi lmstrip – that the most extravagant design option. The option ‘2’ is a simple frame and option ‘1’ is a hardly visible, narrow frame. If you do not want any frames, under ‘value’ enter a ‘0’ or delete ‘Treatment’. Confirm with ‘OK’ and close the registry editor with ‘File | Exit’. Windows will display desired frames from now on without restarting the computer.